Around the world the Catholic exodus has begun. Here in the United States, a steadily increasing stream of “had it” Catholics is leaving the Roman Catholic Church. Parish closings around the country have become simply a sign of the times. Roman Catholic dioceses across the country have been struggling for years to maintain aging churches because of falling attendance, a priest shortage, and financial problems. Now they are simply closing shop. Catholicism has lost more people to other religions or to no religion at all than any other single religious group in the United States. These are individuals who were baptized and raised Catholic but who now no longer identify themselves as Catholic. Furthermore, if one excludes immigrants and converts from the calculations, the Catholic Church has lost to other religions or to no religion at all, 35.4% or more than one-third of the 64,131,750 of its native born members. This amounts to almost 7 out of every 20 adults who were baptized as Catholics. more than 22,750,000 people who have left? A couple days ago, in an interview with The Associated Press, Archbishop John Nienstedt (Archbishop of St. Paul / Minneapolis) talked about plans to close 21 churches in the archdiocese. “A smaller church isn’t a bad thing if the people in it are more strongly committed to Catholic principles” the Archbishop stressed, because “a shrinking church can still be influential on cultural issues.” This is what we call the “holy remnant” idea that is also very popular with Pope Benedict. Archbishop Nienstedt made headlines earlier this month when he denied Communion to a group of college students from St. John’s University and the College of St. Benedict because they were wearing rainbow-colored buttons in support of gay rights. Heaven knows — some of them were probably even gay. Nienstedt is a popular fellow. 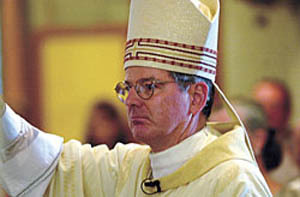 He recently angered a lot of Catholics with the mailing of a DVD that opposes gay marriage in Minnesota. Of course. We all know that Jesus said that as well. The Archbishop and I are both “100% Catholic” because we both share Baptism; that’s all it takes. Engaging in communion wars in place of dialog is church-dividing; a very un-Catholic thing, indeed. I am not a militarist and have no desire to engage in a “communion war” with anyone. That being said, John Nienstedt (whom I know from when I also lived in Motown) is a narrow-minded archbishop whose positions about a smaller church, and homosexuality, are just plain wrong.